For the festive Jewish holiday of Purim, try these wonderful Lemon and Poppy Seed Tartlets. Using poppy seeds in the tartlet crusts makes them especially appropriate for Purim. Why eat Poppy Seeds for Purim? This tradition honors Queen Esther. When she moved into the king's palace, in order to avoid eating non-kosher food, she ate only seeds and legumes. In other words, she ate as a vegetarian. This gave rise to the custom of including poppy seeds in Purim sweets and of making use of beans and chickpeas in Purim menus. Press 1/4 cup dough evenly into each tartlet shell with floured fingers (dough will be moist) and lightly prick bottoms with a fork. Chill until firm, about 20 minutes. Put shells on a baking sheet and bake at 375 degrees F (190 C) in lower third of oven until golden, 20 to 25 minutes. Transfer to a rack and, when shells are just cool enough to handle, carefully loosen edges with a thin knife and remove from pans. Fill each shell with 3 tablespoons lemon curd (see recipe for lemon curd below). Beat together cream with confectioners' sugar and lemon juice in a bowl with an electric mixer until it just holds stiff peaks. Transfer to a pastry bag with a decorative tip and pipe onto curd (or dollop frosting with a spoon). 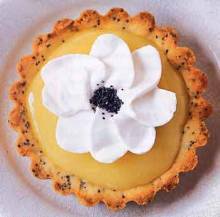 Garnish tartlets with poppy seeds, if desired. Tartlet shells may be made 2 days ahead, cooled completely, and kept in an airtight container. Note: Store-bought ready-made lemon curd may be used in this recipe, if desired. Whisk together zest, lemon juice, sugar, eggs, and a pinch of salt in a 2-quart heavy saucepan. Add butter all at once and cook over moderately low heat, whisking constantly, until curd is thick enough to hold marks of whisk and first bubbles appear on surface, about 10 minutes. Immediately pour curd through a fine sieve into a bowl, then chill, covered. Lemon curd keeps, covered and chilled, 1 week.